Luckily, in 2014 the world was spared the "major" catastrophes of the magnitude seen in recent years, as the 2014 NatCat sigma my team launched today, shows. Nevertheless, earthquakes, floods and severe weather continued to cause tragic loss of life, destroy properties and belongings, and severely impact the livelihood of many people around the world. Last year, monsoon rains in the northern state of Jammu and Kashmir in India and the neighbouring region in Pakistan resulted in the worst flooding in 60 years.At least 665 perished and over 200 000 houses were destroyed. In August, an Mw6.1 earthquake struck Yunnan Province in southwest China, killing 617 people, while 114 remain missing. The quake destroyed 25 800 houses and caused damage to a further 40 600 homes. 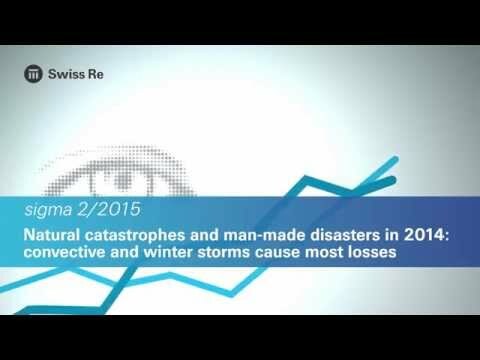 Not discounting these tragic events, the number of victims from disasters in 2014 was actually one of the lowest on sigma records, even though the number of natural catastrophe events was the highest ever in a single year … 189. Improvements in early warning systems and emergency preparedness meant fewer deaths than otherwise may have been wreaked by the forces of nature. Such progress in local prevention and mitigation measures bodes well: it will help strengthen local resilience to natural disasters in the future, especially if climate change leads to more frequent catastrophic events. All told, however, there's no room for complacency. Total economic losses from natural catastrophes and man-made disasters were around USD 110 billion in 2014, and only around one-third of that was insured. A large global protection gap remains a stark reality, to the detriment of society at large. What can the insurance industry do to better equip mankind to face nature's perils in the future?